It was the perfect way to celebrate the weekend before my birthday. I've had to miss a few press junkets due to family activities, family always first. 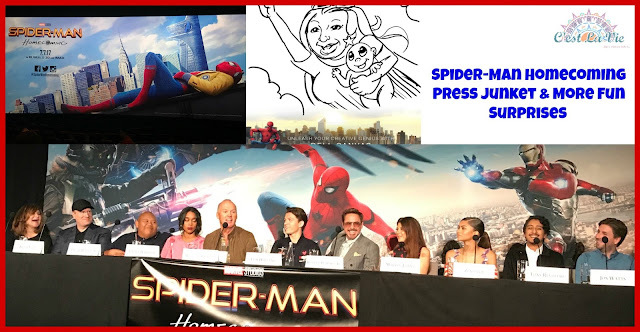 But being the big Marvel fans that we are, I was super excited to be able to attend my first press junket and it be for the newest Spider-Man Homecoming movie. The weekend started with us watching the Spider-Man Homecoming movie on Saturday night, I was able to take 1 guest with me. Can you guess who my guest was? It was Miguel of course, perfect way to celebrate his graduating from Junior High School. I'm hoping not to give away any spoilers from the movie, therefor I won't be giving a full movie review. All I can say is that it is definitely a must watch Spider-Man movie that will have you falling in love with the Spider-Man again, just in case you weren't a fan of the previous one. The characters are made up of an amazing cast, that all bring something special to the movie. You will love the message transmitted to the kids about how being different is not bad at all and makes you that much more unique. Also be ready to laugh out loud a lot during the movie, it is definitely full of lots of action, funny scenes and great NYC views. A most memorable night indeed and perfect way to kick off Summer Vacation. 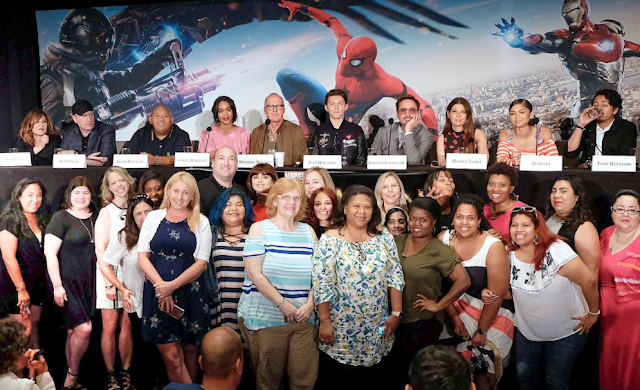 My two favorites Tom Holland ( Spider-Man) and Robert Downy Jr.
Day 2 was press junket day and boy what a day it was. Never in my wild dreams did I think that i'd be surrounded by such an amazing cast. Seriously the best one in a movie that there's been so far. My morning started early with me heading down to The Whitby Hotel located in Midtown Manhattan. There I got to check out some fun Spider-Man Homecoming toys from Hasbro, the latest fun from Dell and grab some yummy breakfast before the press junket began. Before I knew it we were clapping as the cast and directors started walking in. What a junket, again full of laughter. Can I just tell you that Robert Downy Jr is as silly as he is in his movies, you could feel the spark between the entire cast. We got a chance to ask a question to the cast or directors and it was great to listen to their responses. So many questions, so little time. My favorite question that was asked during the press junket was one that was asked to Tony Revolori who plays Flash in the movie. Media: "How does it feel to represent the latino community in such a well known comic book movie franchise"? Tony: Um, it's wonderful. I think the fact that when you see the film there's not a single line of the exposition as to explain why I look the way I look and I think thats wonderful that I'm just in the movie its not about being a certain ways its not about doing anything. I think that's the kind of diversity that we need in Hollywood right now. Media: There's been a lot of buzz about the inclusion and diversity lately and this cast has some of the most inclusive and diverse and just like race change, gender change, characters and everyone is switched. How did you deal with this and what was the inspiration for this? Amy Pascal: I would say the inspiration for this was reality. I told you in the beginning that this movie has the best cast and these two questions just prove the change that this movie brings and it is definitely the best. After the press junket us bloggers, were treated to a most amazing and fun afternoon. so make sure to follow the hashtag #SpideyBloggers to see all of the fun outfits that we come up with. 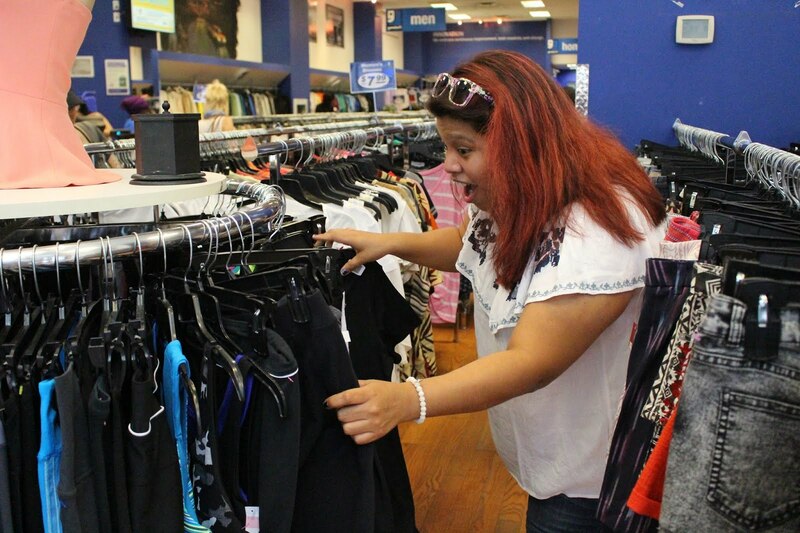 You see that face, it seriously is my "Oh my god, did I just and this at the Goodwill store"? I love thrifting and this was heaven in 15 minutes. I can't wait to share what my final outfit looks like. To end what was an already amazing day, we got to go sailing on the Adirondack. It was the perfect way to unwind after a hectic week of sickness and excitement. 2 hours full of amazing views, yummy foods and yummy drinks. Thank you so much to Sony Pictures for this amazing experience and for making my first press junket a most memorable one. Make sure to check out Spider-Man in movie theaters beginning this upcoming Friday July 7th, as a matter of fact the tickets are already on sale. So make sure to grab your tickets before they sell out.